The black ROBEN-3TM Rackmount Thunderbolt 2 to PCIe Expansion Chassis from Magma features three full-length, full-height PCIe expansion slots. It offers the ability to embed an Apple Mac mini directly into the system chassis that gives you 3-slot Thunderbolt expansion capacity. 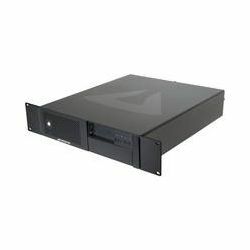 This rackmountable aluminum chassis features a mounting bracket for internal housing of Mac mini, 540W power supply, auxiliary power, and Quiet Temperature Controlled (QTC) cooling with an 80mm 33.4 CFM expansion card/backplane fan. The optimizing backplane flawlessly integrates PCIe expansion, storage, and Thunderbolt connectivity for maximum performance and speed. Produkt został dodany 15.09.2014 15:03. Ostatnia zmiana danych produktu miała miejsce 15.09.2014 15:03.